Navigate our site by exploring the headings above. Speak out on NSAC discussion blogs. Read and interact with NSAC’s opinion writers. Contribute to NSAC! We welcome your support! 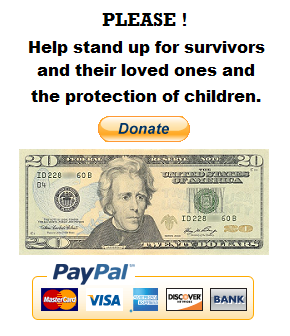 The NATIONAL SURVIVOR ADVOCATES COALITION (NSAC) is a confederation of Catholics and community of men and women of goodwill and conscience who are linked to each other in the common pursuit to promote justice for survivors of sexual abuse especially by any clergy from any and all religious institutions. NSAC celebrates the lives of survivors indelibly marked by courageous suffering and struggle against the burdens of sexual violence and insidious denial. NSAC stands in solidarity with survivors in their lifelong struggles for justice. NSAC advocates in the media and with government for the safety of all children from sexual abuse and exploitation. NSAC speaks out to expose outrageous conspiracies of silence and denial by religious and governmental authorities who have betrayed our trust. NSAC’s anger and outrage has fueled our courage so that we live in hope. JOIN US! The struggle continues each day. Be informed. Learn you can make a difference. Join your voice with the growing chorus for change. Together we are strong. LIGHT just one candle in the darkness! Pope Bergoglio joins the ranks of some notorious folks as ” Man of the Year.” In ’38 it was Hitler, followed by Stalin in ’39. George W Bush twice as well as some folks who helped in the peace process. Bergoglio’s past and present disregard for decency regarding cleric child sexual violence will catch up to him. Could you please let your readers know about this petition.